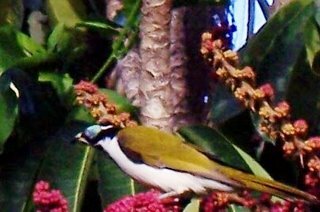 We get a huge variety of birds in our backyard. 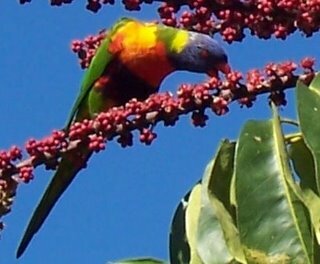 Next to our deck we have a big umbrella tree and the rainbow lorikeets, scaly breasted lorikeets (greenies) and blue faced honey eaters flock there to feast on the nectar from the blossoms and fruit that give the tree its name. The blue faced honey eater is a very handsome bird - a lovely olive green with a blue area of skin around the eye. 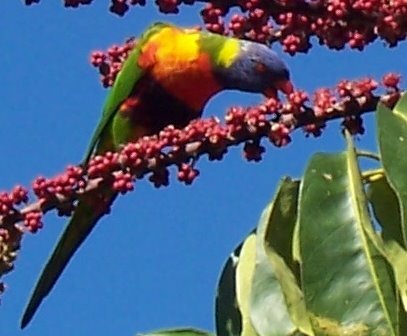 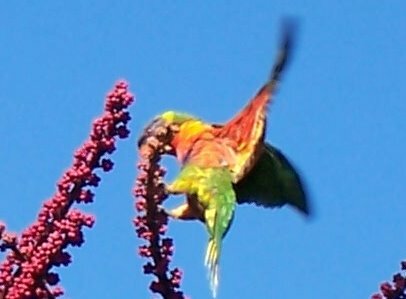 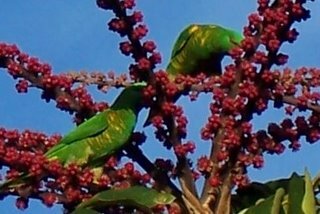 But oh, the rainbow lorikeets !! Those unimaginable colours!! The photos of the scaly breasted lorikeet, or greenie, don't do it justice, that green with little yellow feathers on the breast, is the most eye watering bright blue green you ever saw!